The world’s #1 ranked tennis player, Novak Djokovic, has bought the world’s entire supply of donkey cheese. It’s the world’s most expensive cheese, and it’s called pule. It’s made in one farm in the world, and it takes 25 liters of donkey milk to make 1 kilogram of pule. It sometimes sells for over $500 per pound. It supposedly has 60 times more Vitamin C than cheese from cow’s milk. Djokovic is opening a chain of restaurants which will feature this cheese, so he bought the upcoming year’s supply of it for his own use. Supposedly this cost him millions of dollars, but he can afford it. He’s been a top 3 tennis player in the world for several years now, and last year he made $19.8 million. The Buffet o’ Blog staff has talked about opening our own restaurant, but we’ve never considered cornering the market on a single ingredient. There’s an obvious reason for that — it takes beaucoups of money. Instead, we’ll just have to create the most awesome restaurant, which I’m confident we could do, given a reasonable amount of investment. Somebody out there has more money than ideas, and we’re still waiting for their people to contact our people. If you know one of these people, give ’em a swift kick or light a fire under ’em (not literally), to push them in the right direction. I know there’s already some great restaurants, but it’s clear that many places just don’t get it. For example, I know of restaurants that don’t use any bacon… for anything. Obviously, you don’t have to, but given the fact that bacon makes almost any dish considerably better, why would you not have bacon in your restaurant? These things seem like common sense to us, but as the saying goes, common sense isn’t. I saw a commercial the other night for an “Ultimate BLT” from Arby’s. It had my attention because of how often they said bacon (probably 7 times). They used big grandiose terms like “monument to bacon”, etc. So naturally I was expecting good things from this new food of theirs. 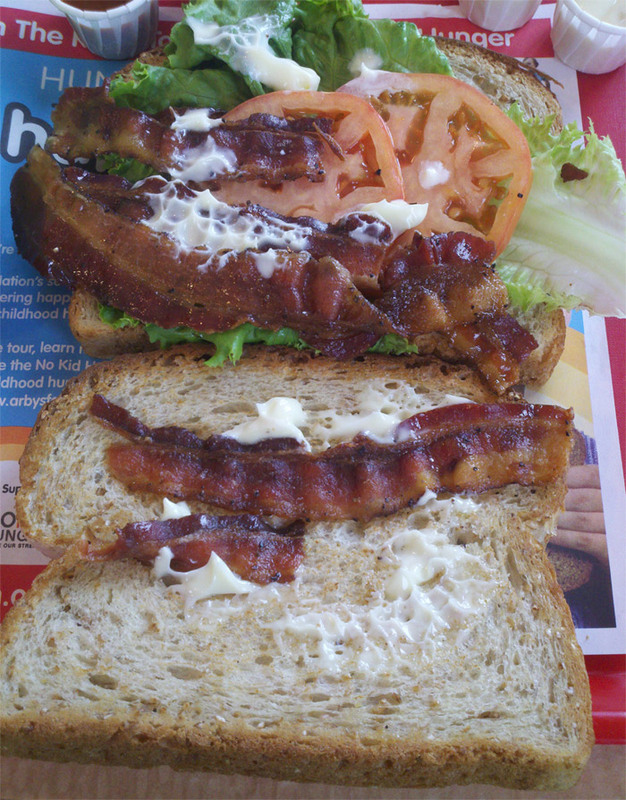 Then they actually shows the sandwich, which contains only 5 pieces of bacon. I was suddenly disappointed. And that’s with their commercial depiction. Here’s a picture of one that someone purchased. Arby’s “Ultimate BLT”. 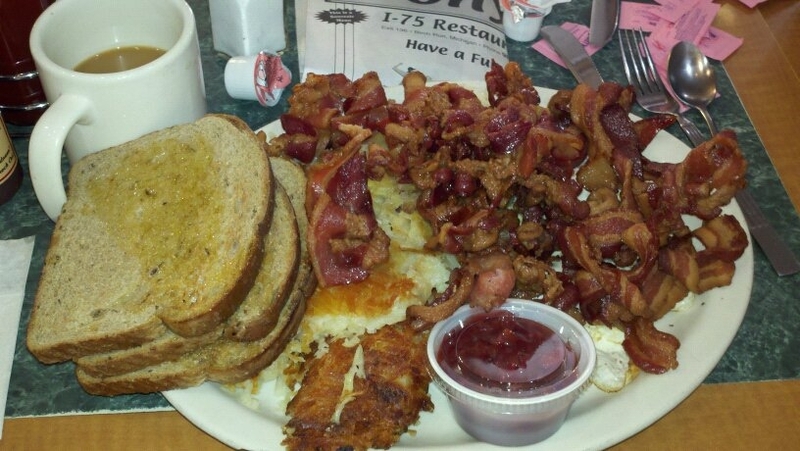 There might be 5 pieces of bacon, but not 5 full strips of bacon. This is so not the ultimate BLT. I realize fast food often does not look like the commercials — I get that — but this is not an “Ultimate BLT” by any stretch! 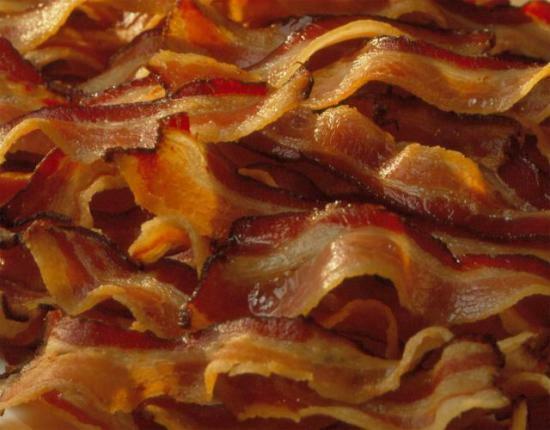 * I think anything to be declared the “ultimate” in bacon should have a minimum of 1/4 lbs of bacon… anything less and it just sounds a bit puny. I’d laugh if I saw a commercial touting something like 1/8 a pound of bacon! * Even if one cares about the other 2/3 of a BLT, you’d still need bacon to be prominent over the LT. I’d say at least 1/4 lbs, but I’d recommend (and like to research) 1/2 lbs. * To be “ultimate”, they’ve got to take it to the next level. BAM! For starters, add melted cheese to it, and Miracle Whip. Some chipotle sauce would go well with it, too, I think. For the cheese, could probably use cheese dip with Rotel to pour on it, just make it thick enough to stay in the sandwich. * Add a fried egg to it! Well, if you’re gonna call it ultimate, add several eggs and more bacon. And cheese, of course. Tell me this wouldn’t sell like hotcakes! I would eat this for any meal of the day. Burger King has for years said you can “have it your way”, and in Japan, you can add 15 strips of bacon to a burger for an extra $1.25. (I don’t know what it costs at Burger King in America, but many restaurants charge an extra $1 for 2 small strips of bacon.) It may not be premium bacon, but, it’s bacon. Adding 15 strips of bacon to one burger should be plenty for most people. However, there is always someone who will say, “Needs more bacon.” (Check out our Food Critic series for evidence of that.) 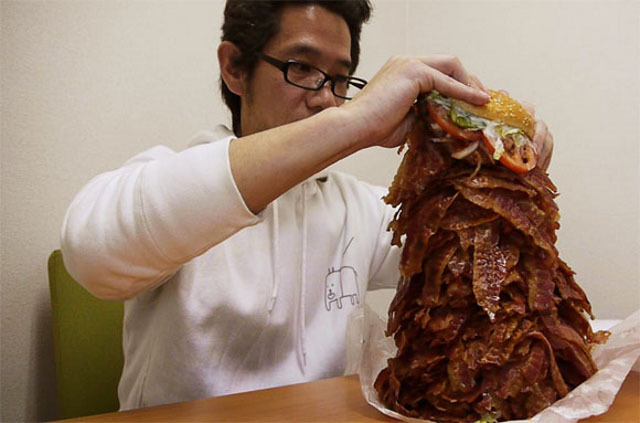 So one guy in Japan added 1,050 extra slices of bacon to his burger, which made it $90. I don’t know how he arrived at that total — maybe he just checked how much money was in his wallet. Either way, that’s a LOT of bacon. 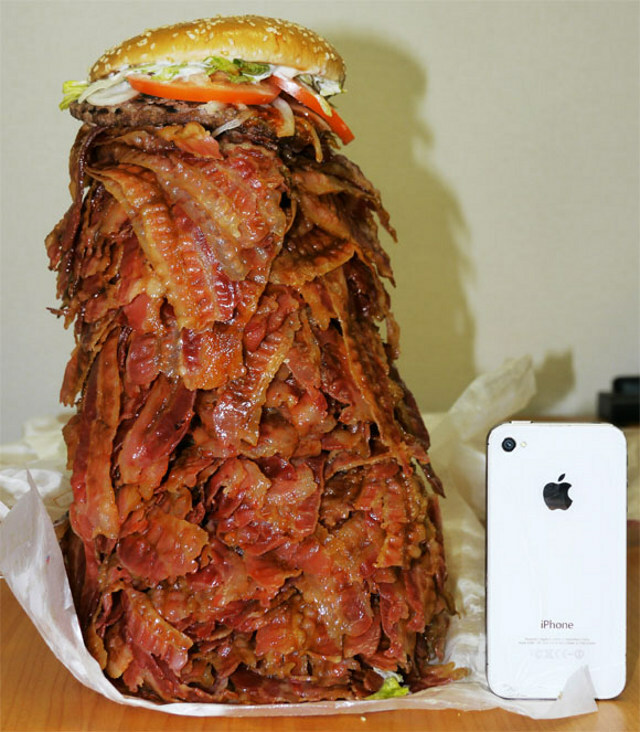 It doesn’t even look like a burger anymore — more like the tower of bacon. To no one’s surprise, he was unable to finish the burger himself. On a related note, sharing bacon with co-workers is a great way to improve morale around the office and build friendships. It’s not uncommon for American restaurants to feature cultural variations on their foods in other countries. Even McDonald’s has some vastly different options around the world. But what’s odd is when an American food company takes American-style food and offers it only in other countries. 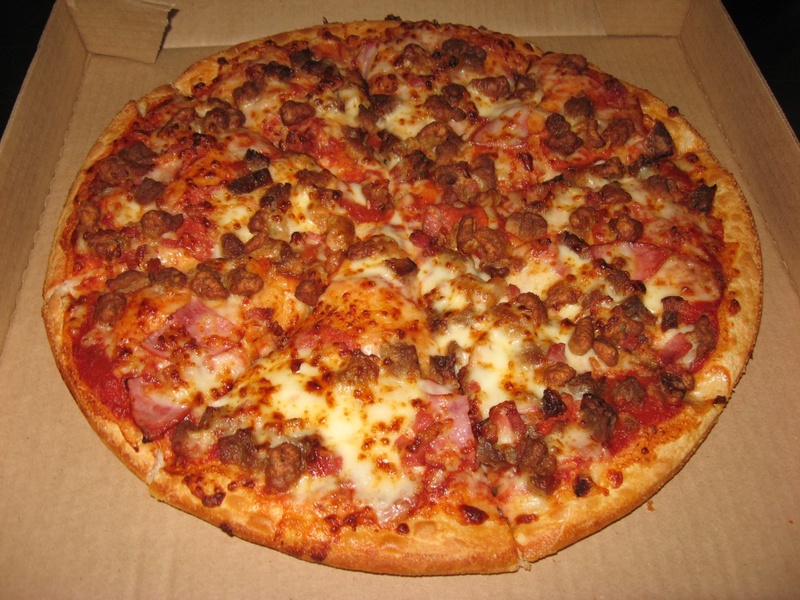 For example, Pizza Hut has several new types of crusts for their pizzas in the Middle East. America has had the stuffed crust pizza for years, which is a great idea. Now, in the Middle East, there is a crust with hot dogs in it, and there’s a crust that’s made up of mini cheeseburgers and one made with chicken nuggets. That seems like something you’d have in the U.S. first. Rumor has it they are considering bringing these crusts to the U.S.
Here’s some I’ve heard of (with the commercial linked so you can see it): Crown Crust Chicken (with chicken nuggets), Crown Crust Burger (with mini “burgers”), Star Pops Pizza (with “sausage pops”, which look like mini hot dogs). Also of note, from Malaysia, there’s the Golden Fortune Cheesy Crown, which has shrimp, fish, pineapple, and “crowns of cheesy liquid gold”. Do we need more super-sized burgers in America? If there’s one thing we need more of in America, it’s eight-pound hamburgers. That’s something you don’t hear too often. There might’ve been a touch of sarcasm if you read in-between the lines (even though it’s only one line). Besides, who could even eat an 8-pound hamburger? Probably not even Adam Richman of Man v. Food fame. What we do need is restaurants offering more options on burgers — like to include copious amounts of bacon, fried egg, various cheeses, ham, different sauces (BBQ, chipotle, cheese dip), etc. Actually, perhaps bacon should come standard on all burgers. Why wouldn’t you want bacon on your burger? [pause to venture deep in thought] I got nothing. This is just another reminder that Buffet o’ Blog needs some venture funding to start our own restaurant.